Sometimes it is all too easy to embrace unchecked aggression, misanthropic sentiments and general misery instead of something wholly innocent and sweet. God knows that most of my listening habits gravitate towards some of the more unhealthy and damaged sounds of the past few decades. However, there are times when I believe in all that is good on this green earth and invest myself in a record that lazes about in the sweetness and light. I happened upon a going out of business sale at a local record store and the sickly sweet cover of this cd really beckoned to me. Maybe I felt it complemented the holiday scenery and haggard St. Nick that lurked outside its doors, but somehow it felt right to purchase this oddball 50s collection. Kitsch has burned my palms more times than not. If I could get a refund for every ridiculous VHS tape, velvet painting and lp that has wormed its way into my grubby mitts…..well, I could buy a fancy dinner with all the trimmings. 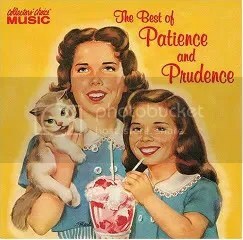 Patience and Prudence were a one-hit wonder of the 50s whose only hit “Tonight You Belong to Me” cracked the top ten. As you can probably infer from the garish caricature adorning the cover, they were a pre-teen sister act that capitalized upon the last gasps of the Pat Boone school of rock. Wholesome tunes may have ruled this slice of American history, but I’ll be damned if their naive yearning for puppy love somehow speaks to the romantic in me. Their aforementioned hit only lasts two minutes, but may be the most compact summation of that moment when you feel the ripplings of your first crush and confuse it for emotions so infinitely vast and lasting. Yes, it is easy to dismiss these early stirrings, but these hormonal percolations are somehow more real than the jaded encounters of today. It reaffirms a faith in love and the belief that your first encounter can toss your heart around like a wiffleball. Yes, their lyrics about the joys of a new dress and a ribbon in your hair may not resonate in your soul, but the orchestration and heavenly, but clumsy harmonies are a perfect antidote for those nights when life gets utterly complex and muddled. When you feel jaded and even flirtations seem stale, listen to Patience and Prudence and remember that there was a time when most of your daily experiences were virgin territory. Their confections will take you back to time before your heart was scarred and heartbreak only happened in the movies.